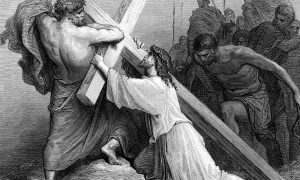 God always has a plan, and although we may not know it or see it at the time, we can look back and understand that what felt like a tough circumstance was really God at work in our lives. Such was the case in the early 2000s. At that time, there were several young couples having difficulties with pregnancy and they were brought together through a new saint, Gianna Beretta Molla. This all happened about the same time the Shrine of Our Lady of Guadalupe was being built, and the story unfolds in the shrine’s painting of St. Gianna Beretta Molla, who is surrounded by children known as Gianna babies. 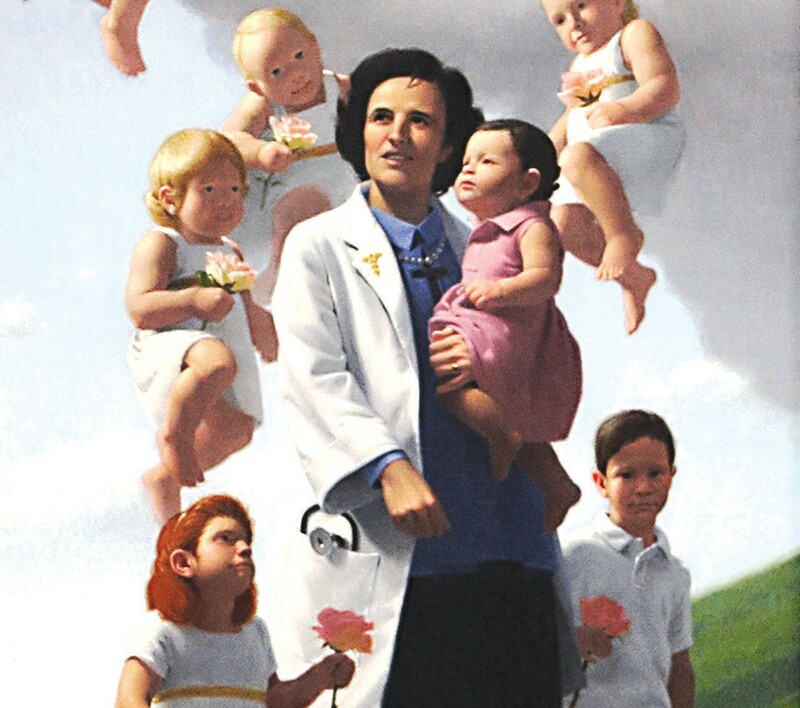 The artist, Neilson Carlin, was painting St. Gianna Beretta Molla when, midway through, it was suggested that she be surrounded by Gianna babies, or children whose births were attributed to her intercession. Above her is Our Lady, Patroness of the Unborn, who is surrounded by unborn children offering roses. What people don’t often realize is that the children in the painting are real Gianna babies who live in or near La Crosse. The Carstens family stands in front of the painting of St. Gianna at the Shrine of Our Lady of Guadalupe. 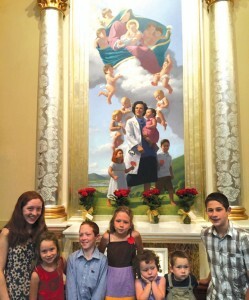 Helen, far left, and Dominic, far right, are portrayed in the painting, standing on the left and right of St. Gianna. Christopher and Marguerite Carstens started working for the Diocese of La Crosse in 1998. Then-Bishop Raymond Burke came to know of their difficulty in conceiving a child. Having relics of Gianna Molla’s wedding dress, he gave the Carstens a relic and asked them to pray for St. Gianna’s help in achieving pregnancy. They began asking for St. Gianna’s intercession. Their prayers were answered — children were born! 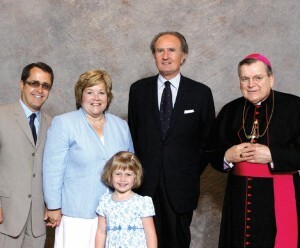 Emily Strom is pictured with her parents, Tom and Amy, Cardinal Burke and St. Gianna’s son Pierluigi in 2009. Tom and Amy got married late in life. 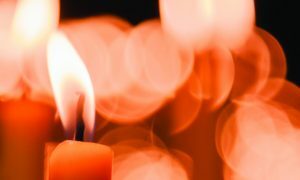 Amy shared, “I was in my late 30s and Tom was 40 — he was one of six, and I was one of five. So, we just loved family life and were hoping that, through the gift of our marriage, God would bless us with children. But, we lost two babies right away.” As he had asked the Carstens, then-Bishop Burke asked the Stroms, “Have you heard of St. Gianna Beretta Molla? 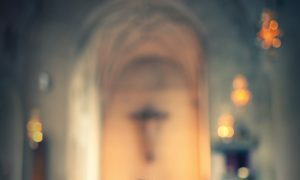 If not, I need to introduce you to her.” Given books about St. Gianna and a relic, the Stroms began to pray, asking for protection of their family. In December 2002, Emily was born. “It was a miracle. A perfect pregnancy,” Amy exclaimed. Emily is the Stroms’ only child. Two more pregnancies followed, but did not come to full term. “I came to realize that I was a mother to all my children, for however long, and I look forward to meeting all my children after this life. We keep the blessings in mind. We are lucky. We just want to be good parents to Emily and help her to be ready for whatever God wants for her,” Amy said. Emily is portrayed in the painting over St. Gianna’s right side.